I really hate packing, although not as much as unpacking. I’m pretty good at rolling my clothes when I’m packing to go on a trip, but by the time I get back home, all my clothes are stuffed haphazardly in my suitcase. And I will use any excuse to take a break while packing. The Husband and I are heading home to Buffalo tomorrow. We always fly Airtran. They have direct flights to Buffalo and the business class upgrades are pretty cheap. Mine was actually free, because I had enough rewards credits to cover it. So I (thank god) have my trusty seat 1D for the trip up north tomorrow. I’ll only have to take half a xanax now. Which is good, because as soon as I get there I am heading straight to a baby shower that I’m co-hosting with my mother for my future sister-in-law and nephew! I needed a break from all that sweater packing (which is not easy when you live in Florida and just moved….) so I thought I would relive my last family trip to Canada. 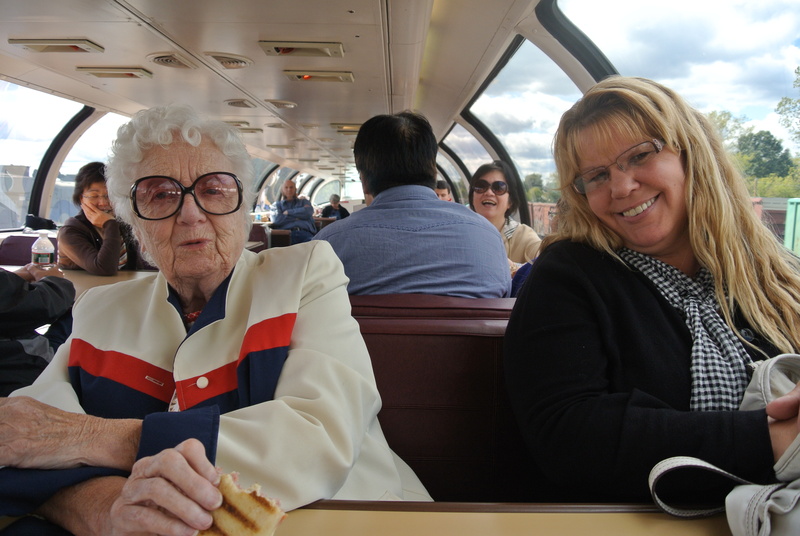 Last September, I took the train thru New York, up the Adirondacks, to Montreal with my mother and grandmother. Business class on the Amtrak from Buffalo to Schenectady. You have to get off the train in Schenectady (unless you want to head to NYC, which I almost tried to) and get on a different train that goes north to Canada. It travels up the border of NY and VT, between the Adirondack Mountains and the Green Mountains. 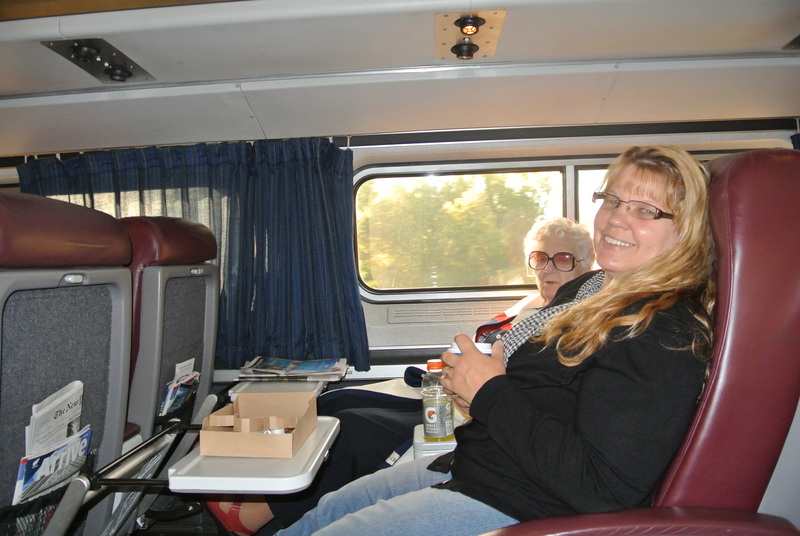 There is a two story observation car that makes it pretty easy to enjoy the stunning scenery. 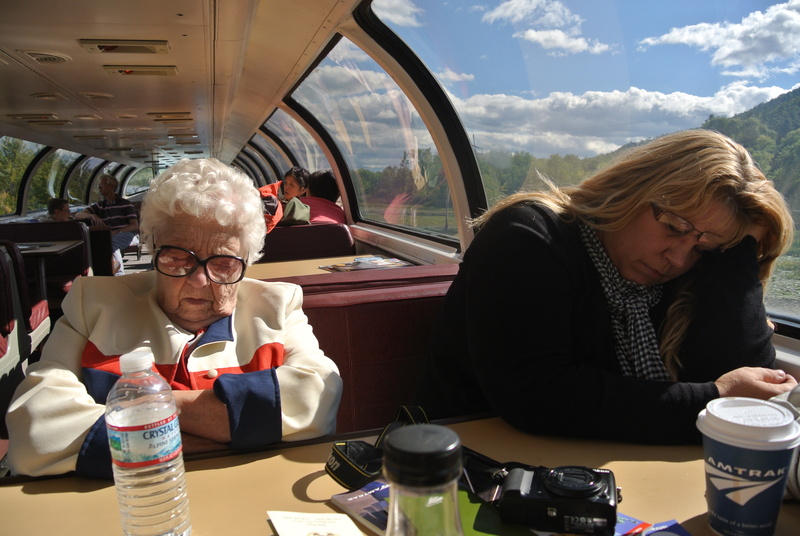 The two story observation car on the Amtrak from Schenectady to Montreal. 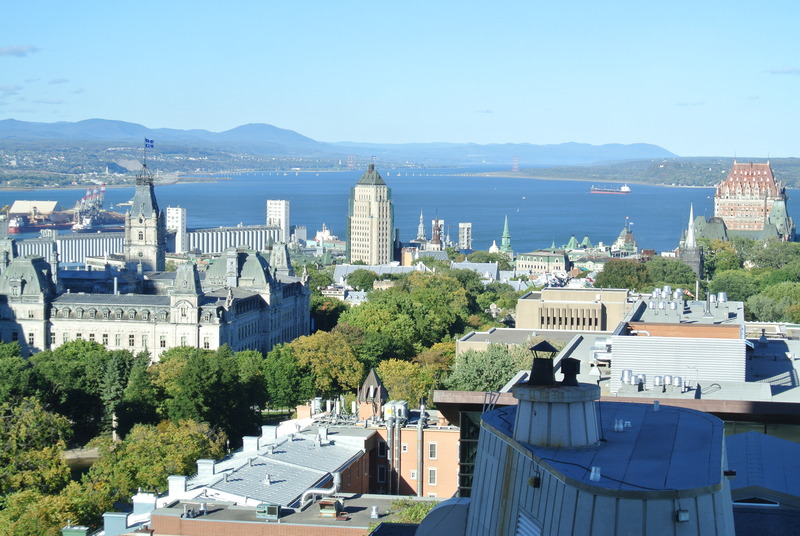 It is quite a long trip from Buffalo to Montreal, and it gets a little boring. So we started happy hour early. Maybe a little too early for mom and grandma. When the train gets to the US/Canada border you have to sit and wait. Customs comes thru, the Department of Agriculture comes thru, and they check your passport and your food items, if you have any. And it takes forever…. like hours….. Luckily we had a pretty view while we sat and waited. Almost made up for the fact that the bar car closed…almost. So we finally made it to Montreal. 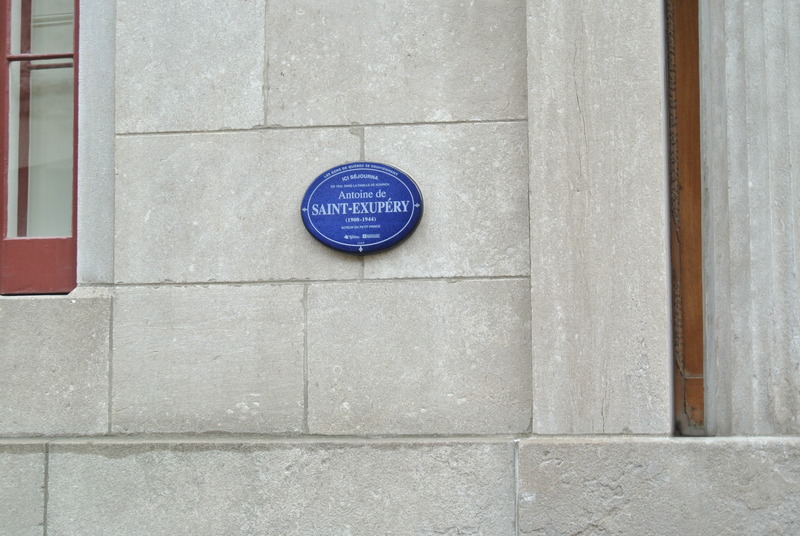 We had just one day in Montreal so we took my favorite kind of tour: a taxi tour. I hailed a cab, made sure the guy was a native (he spoke a little English, which was a bonus) and hired him to drive us around until our train to Quebec City left. 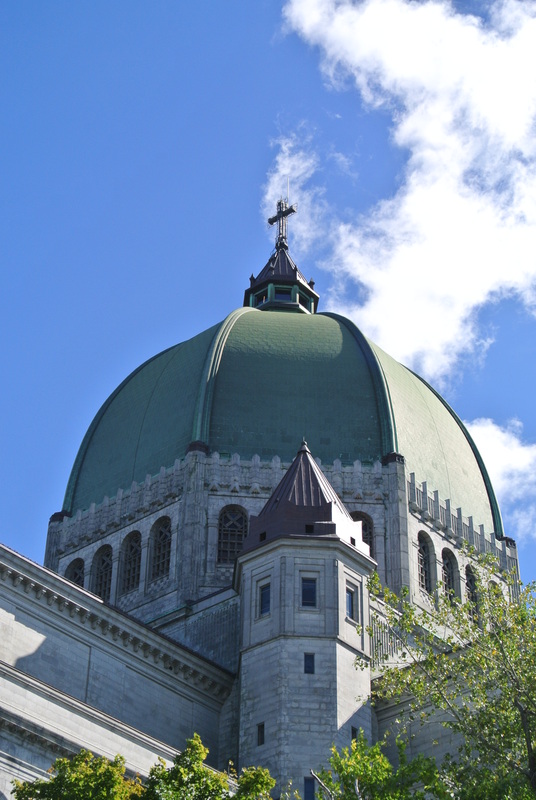 We drove up the hills, past the owner of Seagram’s amazing house, to St Joseph’s Oratory. 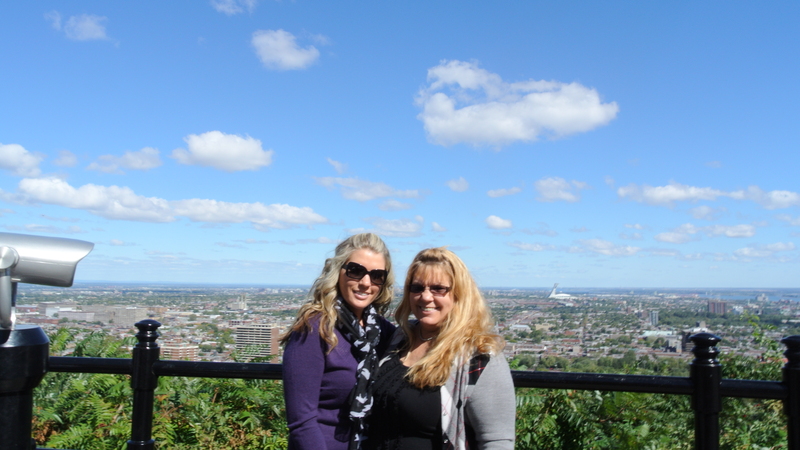 Then we went to a lookout that had a spectacular view of Montreal. So beautiful! Mother and me with Montreal as out backdrop. My mother, (85 year old) grandmother, and I headed over to an empty couch and sat down. It was the only 3 person area open, but there were plenty of single seats. 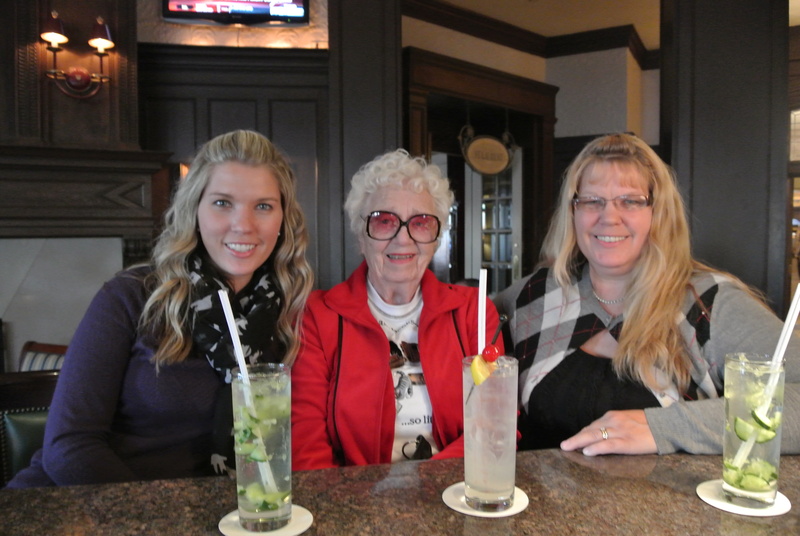 A few minutes later, a 30-something year old woman came over, looked at my grandmother (my 85 YEAR OLD GRANDMOTHER!!!!) and said, “You’re in my seat,” and proceeded to stand there, waiting for her to get up. My grandmother is actually quite healthy, and well mannered, so she got up. But she was sure to over-dramatize the act of standing up, with a few moans and groans. Ugh, what a jerk. 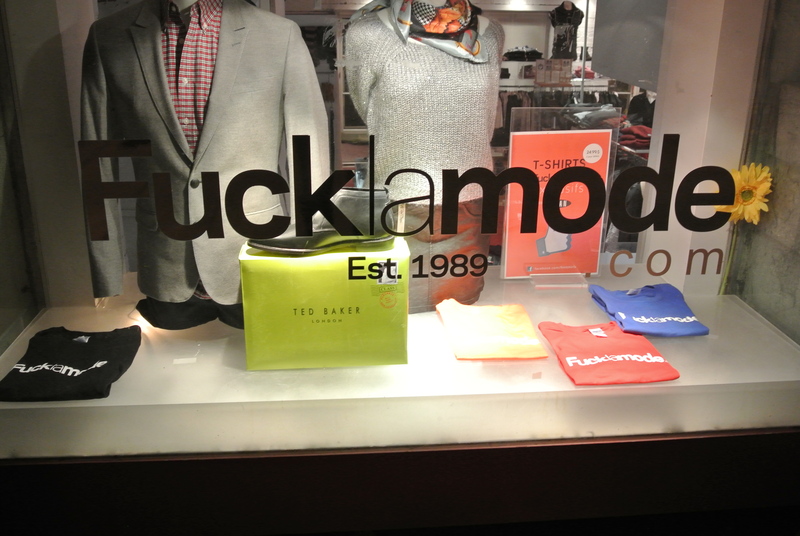 No wonder French Canadians are known as rude. So we were obviously quite happy to get on the train. And the seats were super comfy. 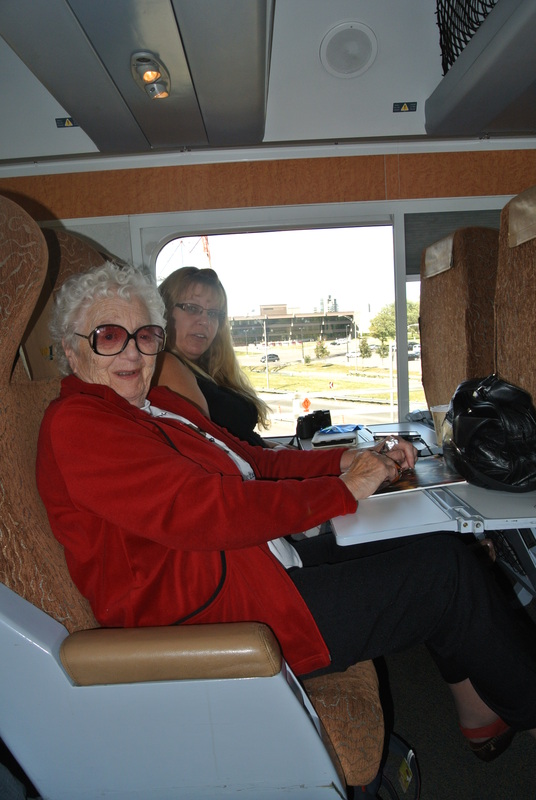 Mom and grandma on the VIA Rail. They served us a three course meal, with wine and drinks, and an extra dessert. And it was fabulous. The food was good and the drinks just kept coming. They served us before the train even left the station! We arrived in Quebec City and hailed a cab. This one did not speak any English. None. At all. Luckily I had just returned from practicing my high school French in France, and I managed to get us to our hotel. 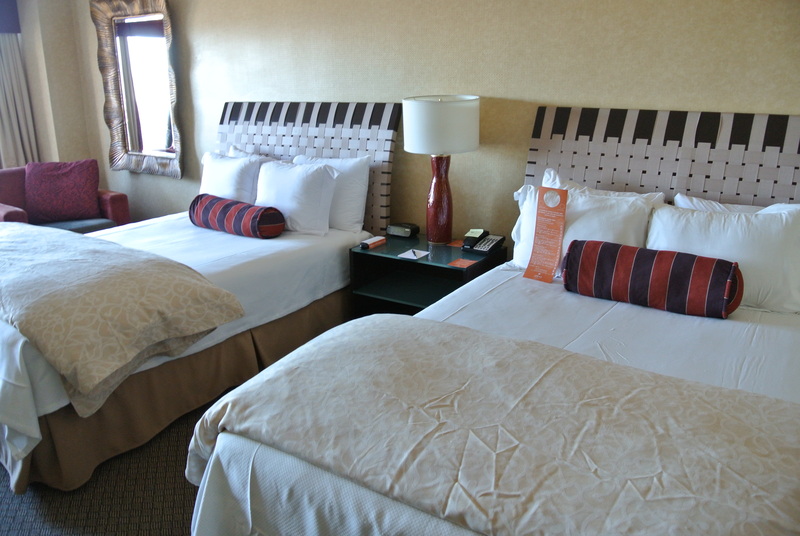 Of course, we stayed at the Loew’s Quebec. 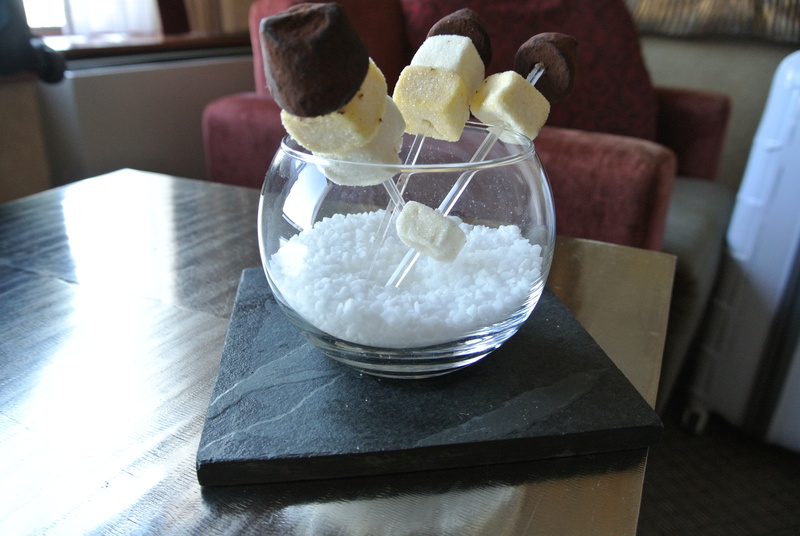 They had a very different welcome amenity, and I was a little nervous to try it. Turns out it was chocolate and marshmallows, and it was delicious. 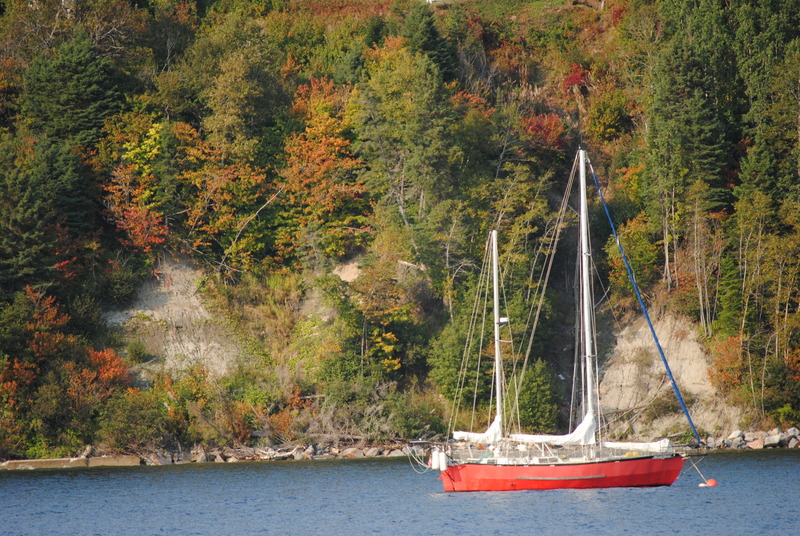 And we had a spectacular view of the Frontenac and the St. Lawrence River. It is breathtakingly beautiful there. So we unpacked and headed down towards the river. Then they convinced me to ride the funicular down to Old Quebec. And it was terrifying! I don’t do heights. Everyone freaking knows that. Yet I keep finding myself in situations where I’m a nervous wreck. I thought, well if grandma can go down it, then so can I. Then I remembered that she’s tougher and braver then I am, and I decided to take the stairs down. But they would have nothing to do with that. 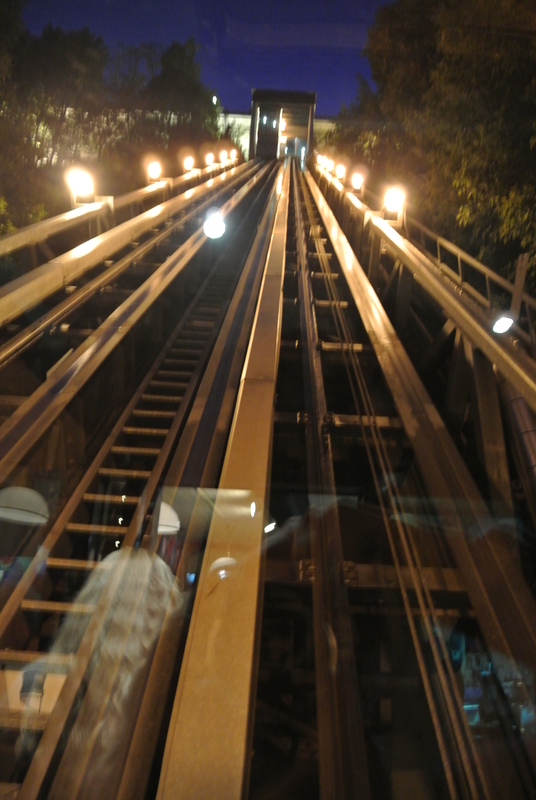 So I got on the sideways glass elevator that they called a funicular and headed down. And I hyperventilated. And almost cried. I prayed. I may have sworn a few times. But I survived. Yea, I actually went down that. Grandma saw this sign and said,”well, I like mine with whipped cream!” OMG she is the funniest lady ever! So after the slightly uncomfortable comment from grandma, we found a place for dinner. And of course I had to have the poutine. 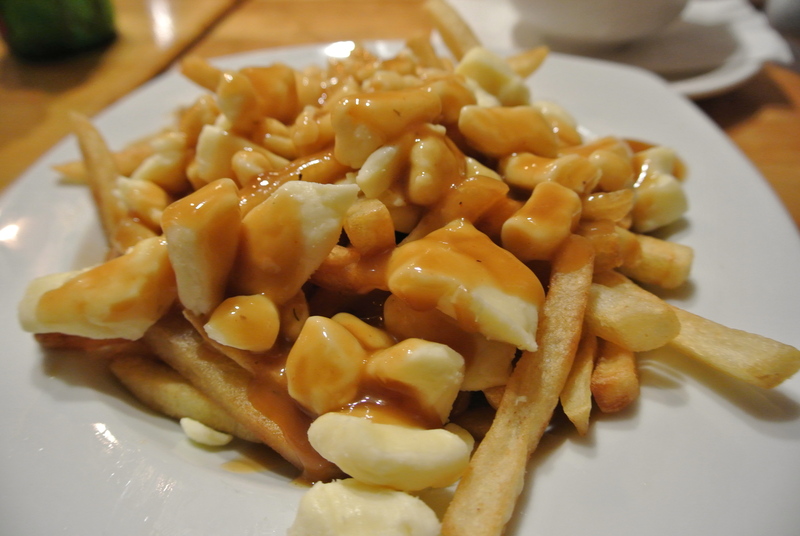 Canada’s french fry, gravy, cheese curd fantasticness. We finished eating and headed back to the hotel. The next day we managed to find a cab driver that not only spoke English, but he also spoke Farsi, Italian and French (obviously). He was delightful! 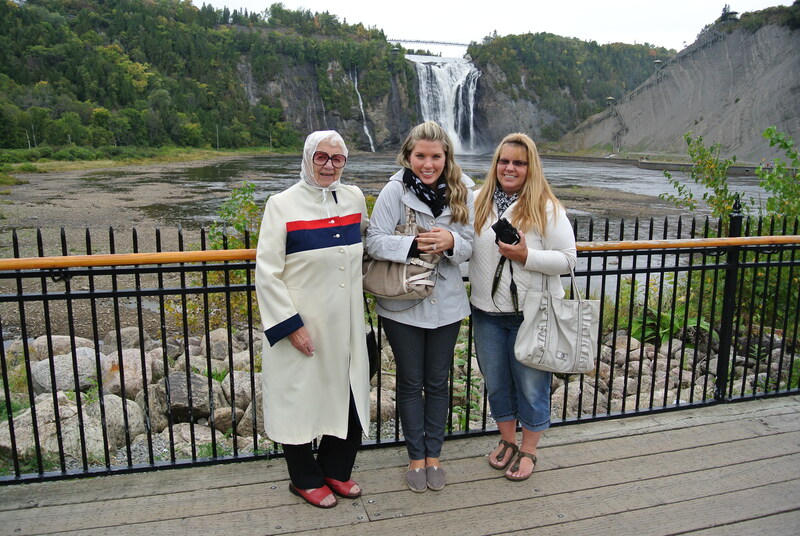 We went to the Montmorency waterfalls. The next day we headed 2 hours down the St Lawrence for a whale watch. It was a long bumpy ride, but it was worth it. 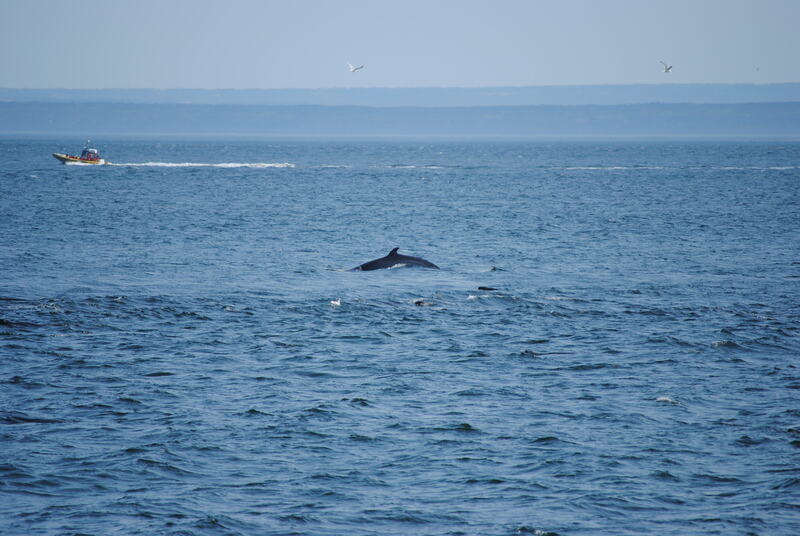 Grandma had never been on a whale watch, and we saw lots of whales! 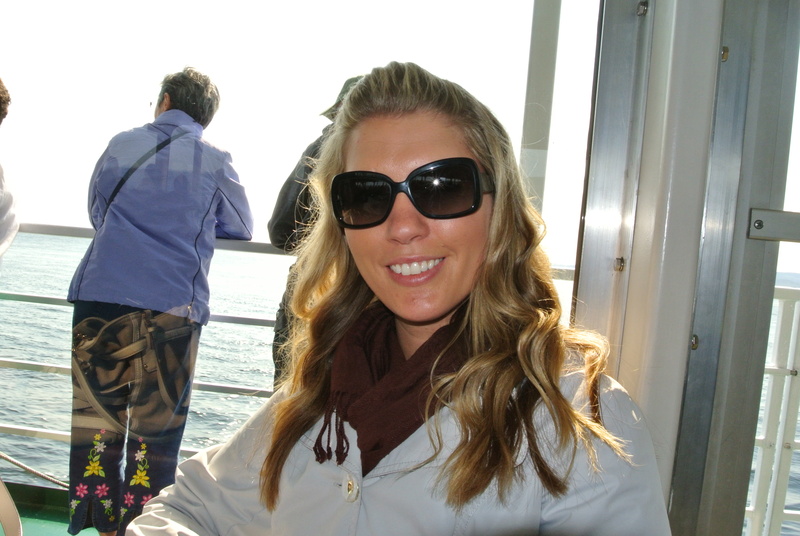 Me on the whale watch. Then the boat went in to a fjord. We had never been in a fjord (an inlet caused by a glacier) and it was really pretty. We got back on the bus and headed back to the Loew’s. 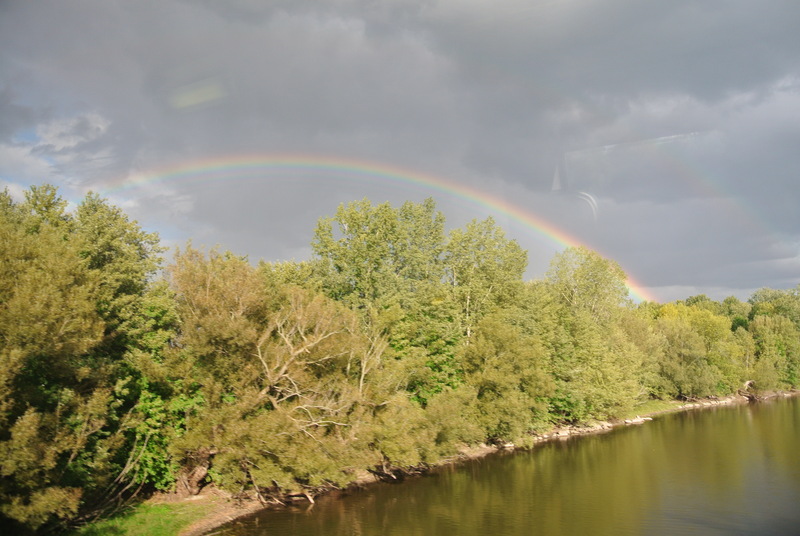 The next day we got back on the VIA Rail and headed to Montreal. 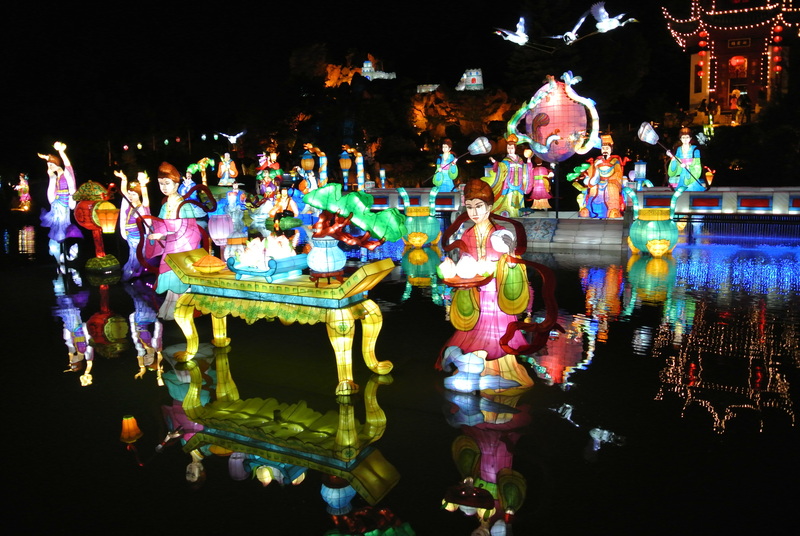 In Montreal, we went to the Montreal Botanical Garden to see the Magic of the Lanterns. It was so beautiful. 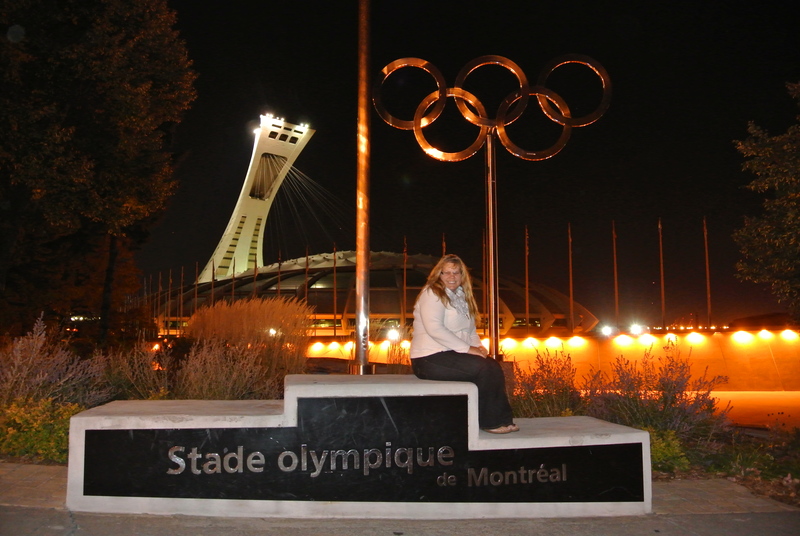 We walked to Olympic Park, to make my Olympic-loving mother happy. Then we got back on the metro. Which grandma loved. It was super quiet; the cars actually have rubber tires. We headed back to our hotel and went to bed. The next morning we got back on the Amtrak (which is extra sucky after taking the VIA Rail) and headed back to Buffalo. It was such a fabulous trip and I can’t wait to get back on the train Friday!